The 3rd World Botanical Gardens Congress (3GBGC) opened on 16 April in Wuhan, capital of central China's Hubei Province. 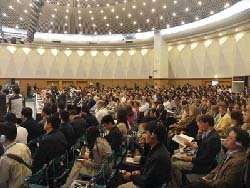 Under the auspices of the Botanic Gardens Conservation International (BGCI), CAS, Hubei Provincial Government, the State Forestry Administration (SFA) and Wuhan Municipal Government, the five-day meeting brought together nearly 1,000 scholars from botanical gardens, research institutes, universities, governmental departments and non-governmental organizations in 89 countries. Chaired by CAS Vice President CHEN Zhu, the opening ceremony was also attended high-ranking officials and celebrities in the field, including vice chairman of CPPCC, the country's top political advisory body, ZHANG Siqing, Governor of Hubei Province YU Zhensheng, President of the National Natural Science Foundation of China CHEN Yiyu, Vice President of China Association for Science and Technology QI Rang, CAS Vice President LI Jiayang, Vice Director of SFA LEI Jiafu. Chair of BGCI Board Baroness Joan Walmsley, Secretary General BGCI Sara Oldfield, and President of Missouri Botanical Garden in US Peter H. Raven. The main goal of the Congress is to review the contributions of botanic gardens to the Global Strategy for Plant Conservation through the implementation of the 2010 Botanic Garden Targets. It will highlight success stories and identify gaps, providing opportunities for botanic gardens to exchange experiences and learn from each other. By evaluating progress so far, the Congress also aims to provide a framework and guidance for the work of botanic gardens for the period from 2007 to 2010. Held every three years, the Congress is recognized as the primary international event for botanic gardens worldwide. This is the first time it has been held in Asia and will mark the 20th anniversary of BGCI. The 2007 Congress, which is hosted by the CAS Wuhan Botanical Garden (WBG), will offer a global forum for the botanic garden community to share their knowledge, experience, practice and research. "We have prepared an exciting scientific program, including presentations by distinguished speakers, symposia on a wide range of topics, participatory workshops, field excursion and garden visits," says HUANG Hongwen, director of WBG.